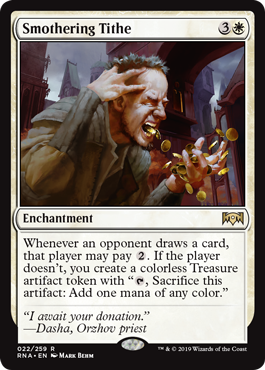 Can I just say up front how happy I am to see treasure tokens outside of Ixalan? Too often in the past, we’ve seen Magic come up with a good idea and then decide that it’s linked inextricably to just one set or plane, like viking themes in Coldsnap. The treasure concept would have been insane to limit in such a way: while it’s absolutely necessary for a pirate-themed block, it works in numerous settings. The Orzhov are a good fit for it, but I’d say it could also work well in Zendikar’s Dungeons and Dragons-inspired adventures, or as part of Bant’s wealthy and chivalric political dynamic. Smothering Tithe might seem a little discouraging on first reading. Your opponent has a built-in way to prevent you from getting the treasure token, and since we’re now used to casting spells that cost five and six and thirteen mana on a routine basis, it doesn’t sound too hard. But it’s not just about paying two mana; it’s about paying two mana over and over, every turn, if they don’t want to put you ahead on mana yourself. It’s about making every card-drawing spell and Ophidian-style creature downright dangerous to use, or perhaps have to wait if they’re feeling especially cautious. It might not do quite enough on its own to counteract the kinds of card advantage used in high-level competitive Magic, but the prospect of Sphinx’s Insight ramping an opponent into a Carnage Tyrant will give a lot of players pause in Commander and similar environments. This is an unusual card: it’s effectively white mana acceleration. It punishes decks who draw cards, and it helps you to jumpstart big pushes on future turns. Taxing effects like this have proven in the past to be rather potent when they happen repeatedly; Rhystic Study is a Commander staple because of how much it adds up. People playing the game generates you an advantage, and that can help you to snowball hard. The downsides of Smothering Tithe are fairly clear: it’s four mana, it does little to help you out of a losing position, and this is a bit of an awkward effect for white, a color that doesn’t have a ton of mana sinks. It can branch out into other colors to have a way to sink the mana (and a flexible mana cost is nice), but this asks that you get it to the board as quickly as possible and have a good enough board state to not get insta-killed. This is apt to be a Commander staple, but I don’t think it does a whole lot outside of formats like that.